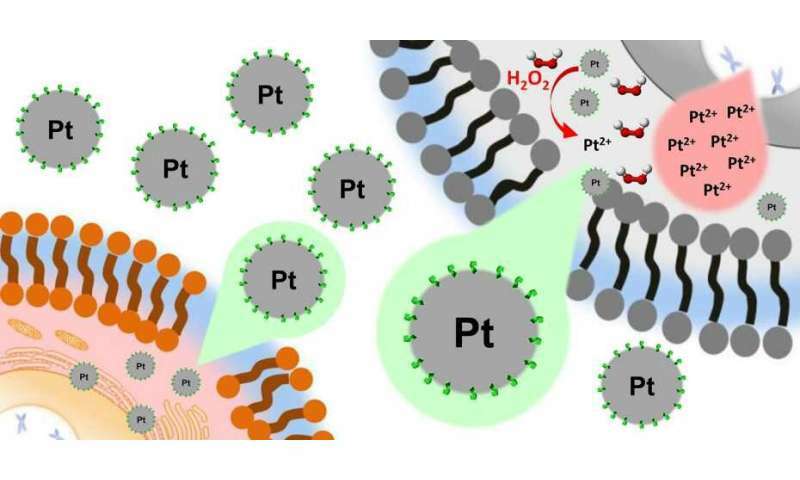 Researchers at ETH Zurich recently demonstrated that platinum nanoparticles can be used to kill liver cancer cells with greater selectivity than existing cancer drugs. In recent years, the number of targeted cancer drugs has continued to rise. However, conventional chemotherapeutic agents still play an important role in cancer treatment. These include platinum-based cytotoxic agents that attack and kill cancer cells. But these agents also damage healthy tissue and cause severe side effects. Researchers at ETH Zurich have now identified an approach that allows for a more selective cancer treatment with drugs of this kind. "We are still a very long and uncertain way away from a new drug, but the research introduced a new approach to improve the selectivity of drugs for certain types of cancer – by using a selective activation process specific to a given cell type," Wennemers says. Future research will expand the chemical properties of the nanoparticles to allow for greater control over their biological effects.